Let’s quickly improve the process! Shall we start modelling it now? Spencer is the project sponsor: he pays. A long-time employee of the organisation, Spencer, 42, is a rising manager with an ear out for the new trends in management practices. 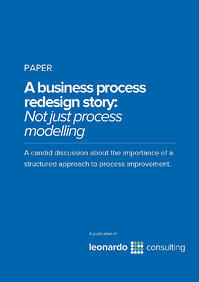 Having heard of BPM at a seminar, he decides to bring in Connor, a process consultant, to solve the issue at hand. Maggie is the project manager: she runs the show. Recently hired away from the competition, Maggie, 38, is now in charge of her first project in the new company and is looking for a win to make her mark. Not knowledgeable in BPM, she is worried the approach could affect the outcome of the project. Connor is the external consultant: he improves processes. A process consultant, Connor, 34, has had good successes with structured approaches to process improvement, but in different industries. Without much knowledge of the one at hand, he knows he’ll need to be convincing to achieve the mandated improvements. Lida is the operations lead: she gets the job done. Lida, 31, having joined the organisation four years ago, has a personal interest in process improvement, so far without having used it herself. A no-nonsense person, she has to make the change happen while continuing her ‘day-to-day’ job.